There's an inherent danger when a work of art embraces the mundane. The example that routinely springs to mind is Andy Warhol’s Sleep (1963), an uninterrupted five hours and 20 minutes of the snoozing poet John Giorno. Interesting, perhaps, but is there any real need to see it in its entirety? Adam Bock’s four-person play The Receptionist courts that danger by pivoting on the transition from the normal to the nefarious. To do so, it must first establish a humdrum setting that is crushingly familiar to many of us: the 9-to-5 office environment. Not the colorful one in movies or sitcoms, mind you, but as it really is. Tedious. Petty. 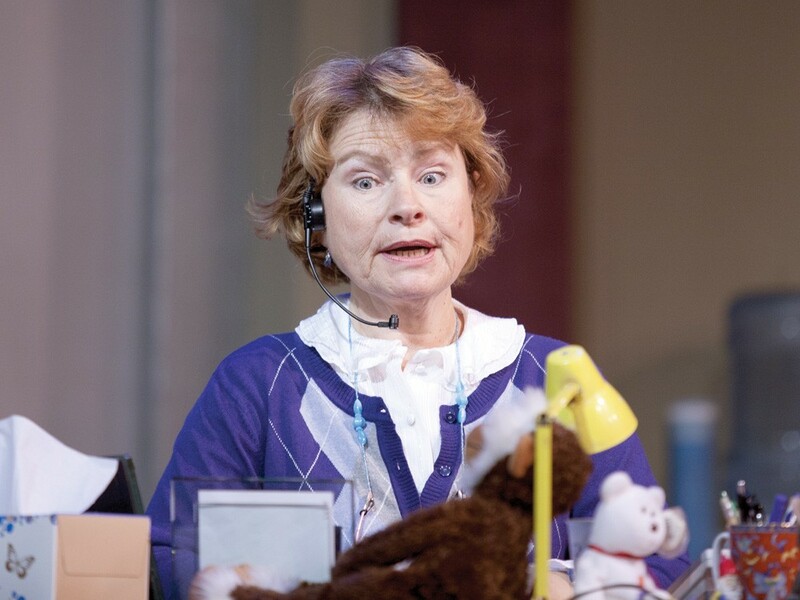 In Interplayers’ current production, directed by Maria Caprile, the eponymous receptionist is Beverly Wilkins (Caren Graham). She doesn’t open the play (that pride of place goes to a spotlighted monologue by Reed McColm, as Mr. Raymond, about the serenity of fly fishing), but, folksy and unassuming as she is, Beverly is still the entity around which the others orbit, the everyman (or -woman) with whom we’re supposed to identify. She’s the one in charge of the pens. She’s the one who sits at a massive, centrally located desk and who greets callers with a singsong, slightly sultry, “Northeast Office.” She’s the one who dispenses motherly advice and judgment in equal measure. She’s the one who knows how to work the coffee machine and the photocopier. While the senior executives are tardy or hysterical or preoccupied, she appears essential to the smooth running of the place. As for those senior execs: There’s Mr. Raymond, whose reappearance is as hotly anticipated as Godot’s. There’s Lorraine (Caryn Hoagland-Trevett), played alternately as a seductress and an emotional basket case. And then there’s Martin Dart (Jorge Paniagua), the dapper emissary from the Central Office. Not long after a sobbing Lorraine has finished recounting the torment of seeing her ex at a club the night before (“I’m in love with a narcissist!” she shrieks, echoing a self-help book of the same name), it’s Dart who coolly emerges from the elevator and inquires after Mr. Raymond. By the time the promised twist arrives, along with Raymond himself, The Receptionist has subjected the audience to a good 45 minutes of atmosphere-building gossip, idle chitchat and paper shuffling. Which means there’s a lot riding on the actors to deliver Bock’s “real-life” dialogue of hesitations and non sequiturs in a way that will at least keep us entertained, if not wholly engaged. As Beverly, Graham was likable and nimbly avoided caricature. Paniagua, despite fumbling a few crucial lines, proved well-cast as Dart. But both McColm and Hoagland-Trevett fell short in ways that revealed the weakness of a script that is not half as subtle or sly as it’s made out to be. Hoagland-Trevett’s Lorraine was three different people — two grotesquely exaggerated for laughs in the first act, then a third who returned from the intermission as someone unrecognizably sober. Mc- Colm played Mr. Raymond as simply dazed instead of mid-epiphany, a misplacement of emphasis that failed to set the right tone for the move from mundane to menacing. Even a fantasy cast might not have succeeded in that move. At heart The Receptionist is a heavy-handed allegory of the inhumanity of rendition and Guantanamo Bay; its moral on the complicity of silence might as well be delivered through a megaphone. Although Bock’s portrayal of the banality of evil ought to resonate with theatergoers, he makes them endure an awful lot of banality before revealing the evil.